Why are School Meals Important? The United States Department of Agriculture (USDA) runs several meal programs in schools that provide healthy foods to children and teenagers. These programs include the School Breakfast Program and the National School Lunch Program. Research suggests that students who participate in school meal programs have positive outcomes. For example, increased student participation in school breakfast programs is linked with increases in concentration and alertness,1 diet quality including fruit consumption,2 and attendance.3 Participation in the National School Lunch Program also provides benefits to students. 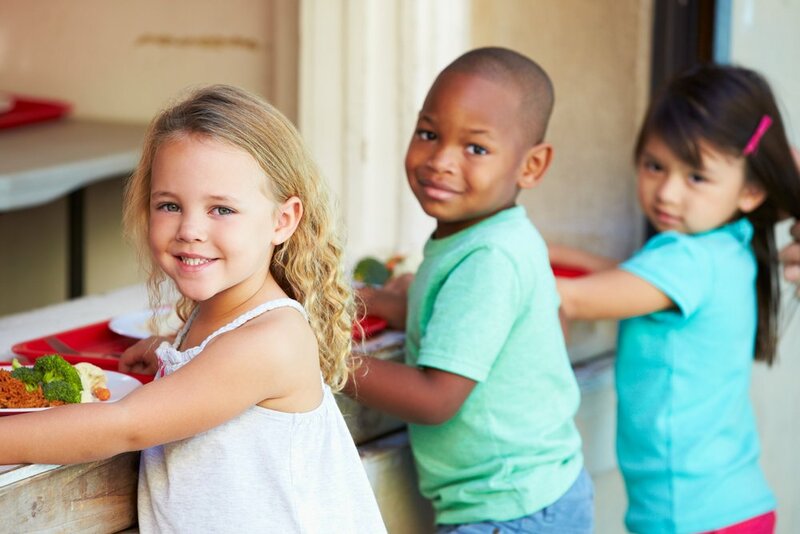 For example, meals served to students at school have more fruits and vegetables than lunches brought from home.4 Schools can increase participation in meal programs by limiting competitive food options, including taste tests of foods on the menu, using the USDA Smarter Lunchroom tools, and incorporating student input on food favorites. It is clear that the breakfast program is compliant with USDA standards. It is clear that the lunch program adheres to USDA standards. The statement is a specific example of a school meal standard that surpasses the minimum USDA standards. This sentence clearly shows that the district has implemented the specific strategy of electronic payment in order to protect the identity of students who receive free or discounted lunch. The wellness policy includes a working and current hyperlink to USDA school meal standards. School is committing to a specific strategy to encourage the consumption of school lunch, students are now able to purchase and eat lunch instead of skipping it for another activity. Clear that students are not permitted to leave campus during lunch periods. School meets minimum time requirement as it provides 10 minutes for students to eat breakfast and 20 minutes to eat lunch once the student is sitting down. This statement clearly addresses both the annual requirement as well as the USDA requirement for continuing education. This statement uses concrete language to ensure a conducive environment for school meals. Nutrition information is made readily available to both students and parents online. The procedure for providing information about determining eligibility for free/reduced price meals is clear and set in place. This sentence uses strong language to be clear that recess proceeds lunch. The school offers free drinking water readily available in the cafeteria. Communication guide for school nutrition professionals to promote their school nutrition programs. More information and resources on school wellness policies and other complementary strategies for community action around childhood obesity prevention. Community action resources to help connect schools with farmers to get local, fresh food into the cafeteria. Topic specific policy and resource materials to assist schools in meeting USDA nutrition requirements. Includes resources for establishing nutrition guidelines, nutrition promotion, and policy guidance. Information on nutrition standards for school meals, updated policy memos, and guidance materials for schools. Wahlstrom K, Begalle M. S. More than test scores: Results of the universal school breakfast pilot in Minnesota. Topics in Clinical Nutrition. 1999; 15(1): 17-29. Au L, Rosen N, Fenton K, Hecht K, & Ritchie L. Eating school lunch is associated with higher diet quality among elementary school students. Journal of the Academy ofNutrition and Dietetics. 2016; 116(11): 1817-1824. Anzman-Frasca S, Djang H, Halmo M. Estimating impacts of a breakfast in the classroom program on school outcomes. JAMA Pediatrics. 2015; 169(1): 71-77. Johnston C, Moreno J, El-Mubasher A, Woehler D. School lunches and lunches brought from home: A comparative analysis. Childhood Obesity. 2012; 8(4): 364-368.